I’m sorry about not keeping up my blog posts, but everything got interrupted for me this summer when my congenital heart murmur (leaky valve) finally began to exact its toll. I spent a few days in hospital, have been home now for three weeks. Doing fine but not doing very much — and that looks to be the way it will be for a while. The notice is followed by a poem about her cat, which you wouldn’t want to miss. How do I enter a work into the Aurealis Awards process, and where do I send my entry form? For all regular categories, you must enter using this online entry form by December 7 2016 and supply a copy of the work(s) entered to each judge in the relevant category/categories by December 31, 2016. Once you have formally submitted an entry via the online form, the coordinator will contact you with the postal addresses for the relevant judges and details for electronic submissions. Entries will not be considered unless the entry fee is paid (if applicable – does not apply to short fiction or Children’s entries). For entries to the Convenors’ Award for Excellence, you must enter using this online entry form by December 31, 2016. Any work of speculative fiction written by an Australian citizen of permanent resident and published for the first time between 1 January 2016 and 31 December 2016 is eligible to be entered. (3) STEPPING FORWARD. Mary Robinette Kowal will oversee Nebula Conference 2017 program. I've just agreed to do programming for the 2017 Nebula Conference. I am simultaneously delighted and WTF DID I JUST DO?!?! (4) FUTURE IMPACT. Adam Frank says the news about Proxima Centauri is important – “Why the discovery of an earth-like planet is such a big deal” on NPR. After all, when the Wright Brothers lifted their rickety plane off the sands of Kitty Hawk, the rest of the world was just out buying their eggs, milk and toilet paper. On that day who knew — or could imagine — that decades into the future millions of people would be sitting in giant jet-planes watching Direct TV and soaring five miles above the planet’s surface. I’m telling you this because two weeks ago a threshold of discovery was crossed when astronomers announced they found a planet orbiting Proxima Centauri — the sun’s closest neighbor. (5) CANSMOF SCHOLARSHIPS TO SMOFCON AVAILABLE. CanSMOF Inc. is offering up to three scholarships for convention runners to be used towards the cost of attending SMOFCon 34, to be held in Chicago, December 2-4, 2016. SMOFCon is the annual convention about organizing Science Fiction conventions. 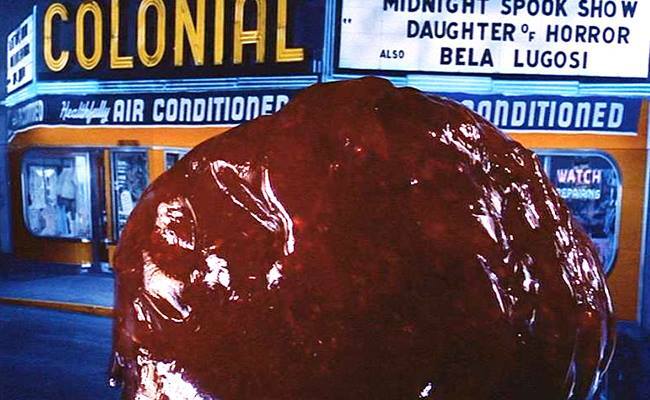 September 12, 1958: The Blob absorbs theatres! September 12, 1993: Chris Carter’s The X-Files aired. (7) TWEAKING GEORGE. George Lucas has tried to overwrite all original prints with his CGI additions, but some fans prefer the vintage original: “Star Wars superfans restore unmolested 1977 print, distribute illegally online”. As reported by Ars Technica, a restored version of the original 35mm print of 1977’s Star Wars (later retitled Star Wars Episode IV: A New Hope) has hit the web. A restoration of the pre-special edition of the film — thought by many to have been permanently altered by Lucas himself — was accomplished by a small group of Star Wars purists called Team Negative 1. How exactly Team Negative 1 acquired the original print is a mystery, with Lucasfilm having claimed that all original 1977 negatives were given the special edition CGI treatment. (8) HALLOWEEN STAMPS. A set of stamps with four different Jack-O-Lanterns will be issued late this month in anticipation of Halloween. 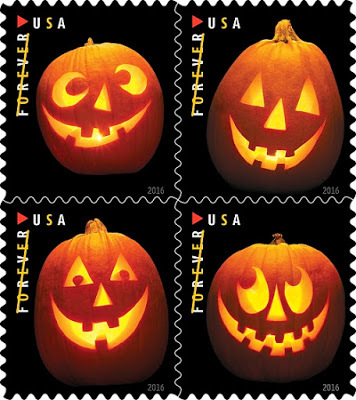 Jack-O-Lanterns – In the spirit of Halloween, the Postal Service issues these delightfully eerie stamps featuring photographs of four different jack-o’-lanterns. These creatively carved pumpkins have been symbols of Halloween in the United States since the late 19th century, not long after celebrations of the holiday began here. These are the first Halloween-themed stamps issued by the Postal Service. Paul Montanari designed and carved the pumpkins under the art direction of Derry Noyes of Washington, DC. Sally Anderson-Bruce photographed the lit Jack-O’-Lanterns used on the stamps. The first day site, Anoka is known as “the Halloween Capital of the World” because it hosted one of the first Halloween parades in 1920, and still holds several Halloween parades. (9) ANOTHER DUCK IN THE WALL. SFWA President Cat Rambo, having spoken at a conference in China, is now enjoying the essential tourist experiences and sharing them on Instagram. From last night – real Peking duck. This entry was posted in Pixel Scroll and tagged Aurealis Awards, Cat Rambo, George Lucas, Halloween, Mary Robinette Kowal, Nebula Weekend, Smofcon, Star Wars by Mike Glyer. Bookmark the permalink. @Kurt Busiek: Totally off topic, but on yesterday’s season premiere of Jeopardy, the winner shared your less-than-common surname. As the new champ, Anne Busiek of Chicago will be returning today. Any relation? Sorta kinda, in that sure, we’re related (just about anyone named “Busiek” is, because the spelling is an idiosyncratic transliteration from something Cyrillic). But not closely — my great grandfather is probably her great-great grandfather, or some such — and I’ve never met her. @Heather Rose Jones: Well said. I’m baffled this teasing joke that turned on a life of its own would be seen as an attack (sorry, @David Goldfarb, I totally don’t see it as ever having been an attack). I don’t even think of Beale when I read a fifth-ish type of comment; I just think “oh, a regular/long-time Filer.” I’m highly skeptical most people even think of Beale when leaving such comments. Of course, I’m too slow to keep up on File 770 and the comments, so all I can do is Godstalk! (also sorry, I’m never thinking of the book when I do this…shoot, I haven’t even read it yet, though it’s on my shelf now!). Sorry to ramble, and hopefully not speaking too far out of turn. HRJ: That’s certainly what I thought it was — just a bunch of people being a little more original than to argue over “First!” I appreciate the explanations, which did clarify a couple of things I’d wondered about. While I’m not likely to join in, I don’t see it as being in any way harmful — just silly. – Arthur, King of the Britons. @Jon Z, good article. Thanks for posting.